Versailles senior Elizabeth Ording puts up a shot against Arcanum’s Gracie Garno during their non-league game on Tuesday night in Versailles. The Lady Tigers won the game, 48-33. 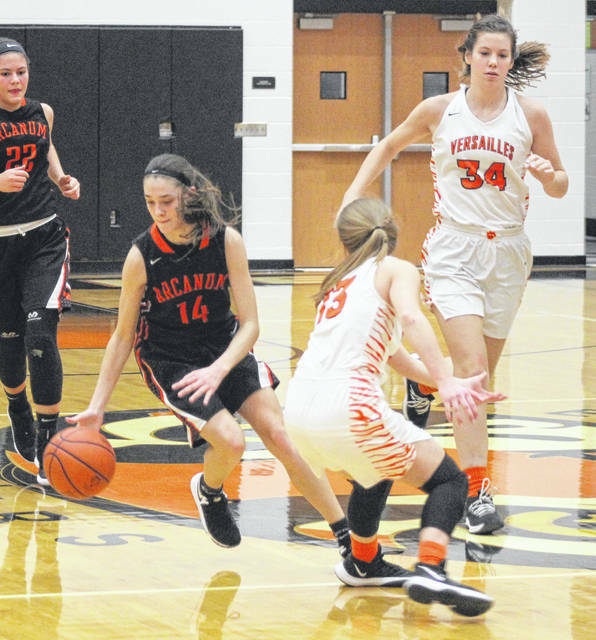 Arcanum freshman Hailey Unger reverses direction while bringing the ball up the floor in a non-league game on Tuesday night at Versailles. The Lady Tigers won the game, 48-33. 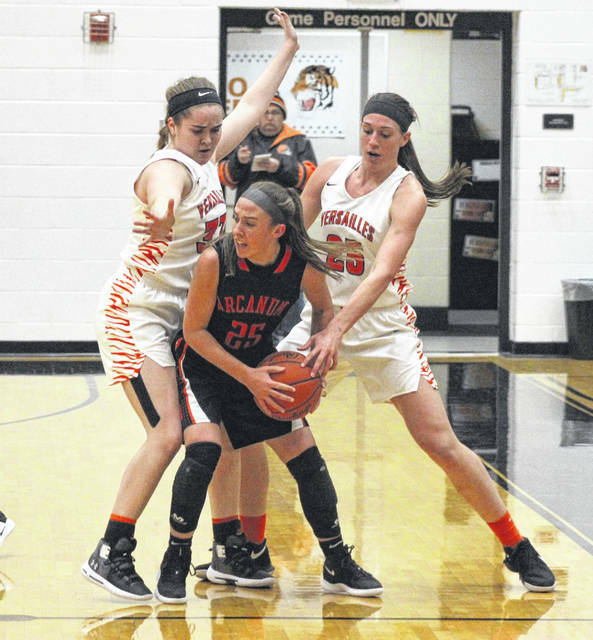 Versailles senior Kelsey Custenborder (left) and junior Lindsey Winner (right) put the trap on Arcanum freshman Madelyn Fearon during their non-league game on Tuesday night. The Lady Tigers won the game, 48-33. Versailles junior Lindsey Winner puts up a shot from underneath the basket during a non-league game against Arcanum on Tuesday night. The Lady Tigers won the game, 48-33. 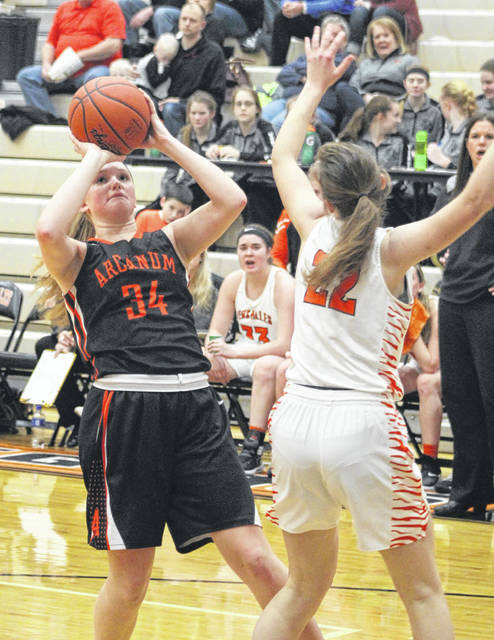 Arcanum freshman Madelyn Fearon goes inside for a shot against Versailles during a non-league game on Tuesday night. The Lady Tigers won the game, 48-33. Arcanum freshman Taylor Gray puts up a shot as she falls backward during a non-league game at Versailles on Tuesday night. The Lady Tigers won the game, 48-33. 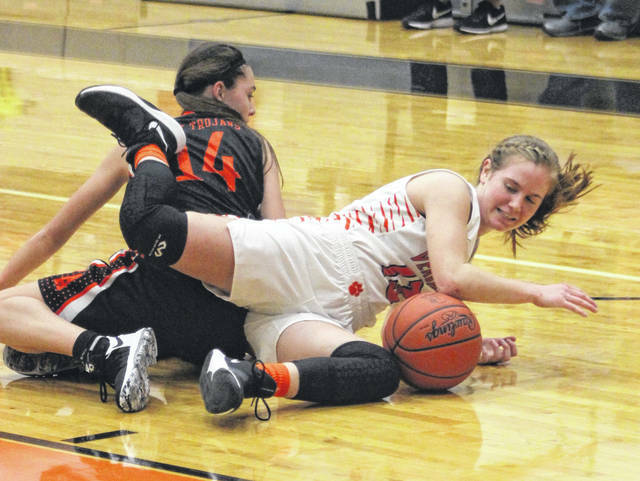 Versailles junior Caitlin McEldowney (13) fights for a loose ball with Arcanum’s Hailey Unger during a non-league game on Tuesday night in Versailles. The Lady Tigers won the game, 48-33. Arcanum junior Camille Pohl takes a shot over several Versailles defenders during their non-league game on Tuesday night in Versailles. The Lady Tigers won the game, 48-33. Arcanum senior Gracie Garno (23) tries to get past Versailles junior Lindsey Winner during their non-league game on Tuesday night in Versailles. The Lady Tigers won the game, 48-33. Arcanum junior Kayla O’Daniel races up court with Versailles’ Kelsey Custenborder on defense during their non-league game on Tuesday night in Versailles. The Lady Tigers won the game, 48-33. Versailles senior Kelsey Custenborder (33) sits down on defense against Arcanum’s Madelyn Fearon during their non-league game on Tuesday night in Versailles. The Lady Tigers won the game, 48-33. 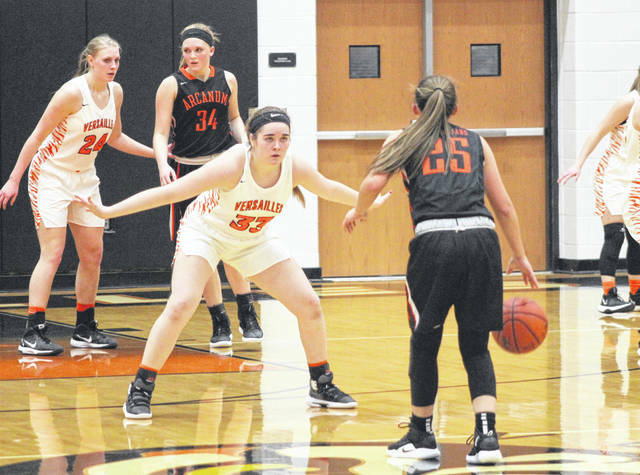 VERSAILLES – A halftime pep talk was at least part of what sparked the Versailles girls basketball team to a 48-33 win over Arcanum on Tuesday night. The Lady Tigers were leading 17-12 at the break, but had several first-half turnovers that led veteran coach Jacki Stonebraker to talk about scoring the basketball more than anything else with her team during the halftime break. 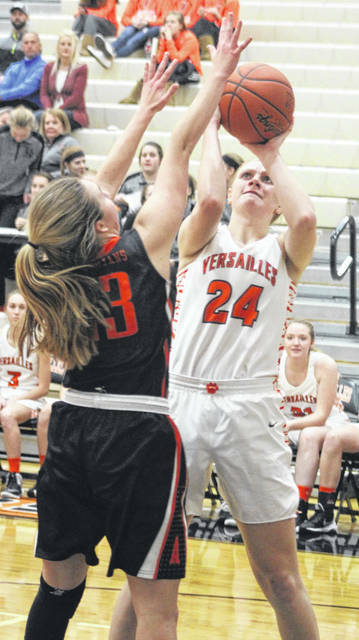 The pep talk worked as Versailles opened the third quarter with an 8-0 run to put a little more distance between them and the young, scrappy Trojans. Senior post player Elizabeth Ording started the 8-0 run almost immediately when she banked in a deuce at the 7:47 mark. 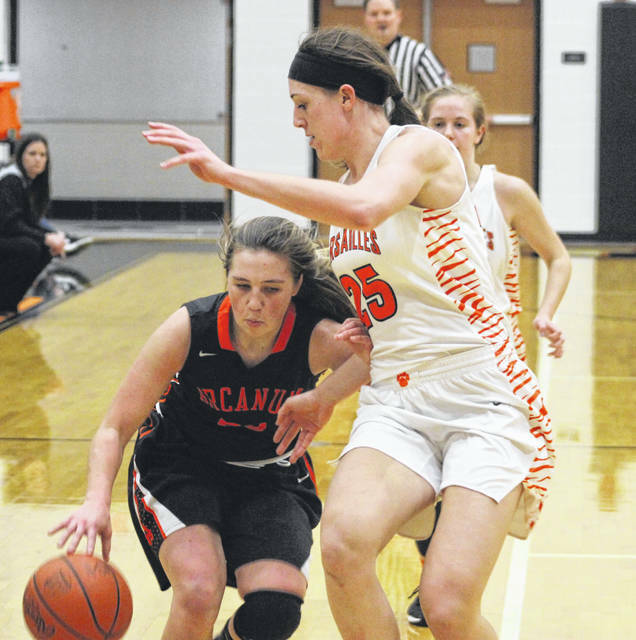 Arcanum’s following trip down the floor was short-lived as junior guard Caitlin McEldowney stole the ball near mid court and took it in for a layup at 7:21. 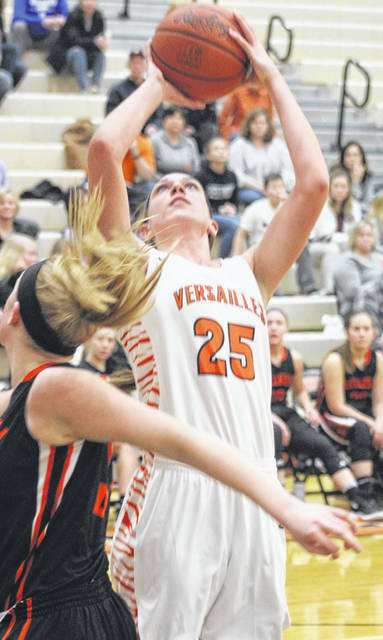 A little less than a minute later, junior Lindsey Winner hit a jumper and then after another Arcanum turnover, VHS senior Kelsey Custenborder scored and just like that – in a span of less than two minutes – Versailles’ lead grew to from 5 to 13 points at 25-12. 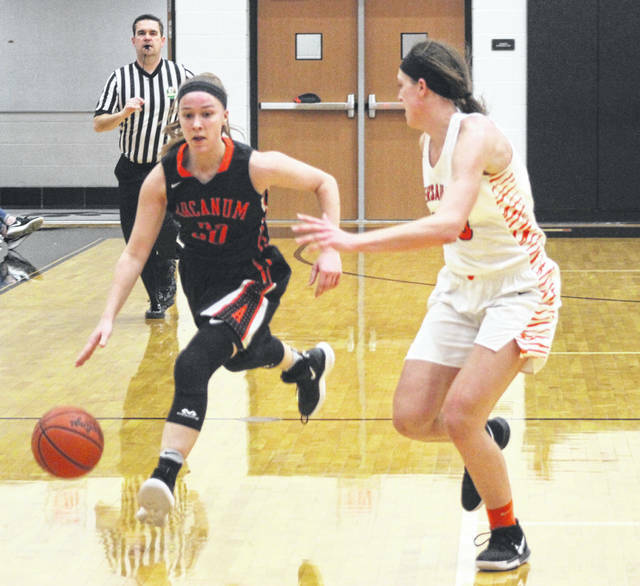 Arcanum freshman Hailey Unger stopped the run with a 3-pointer at 6:05, but the Tigers full-court pressure was intense and led to several more turnovers they converted into points. 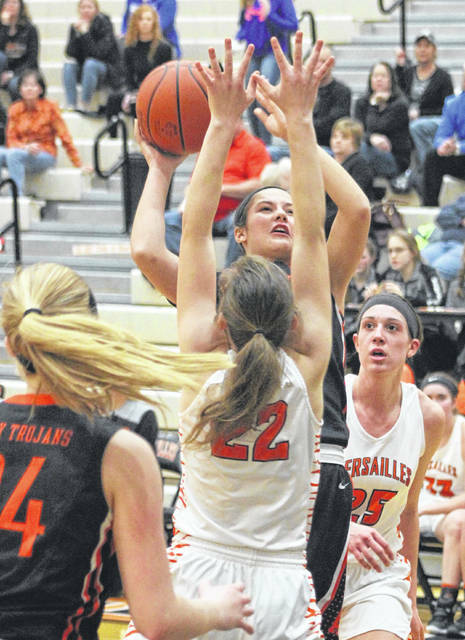 To make matters worse for the Trojans, Versailles did the same thing in opening the fourth quarter with an 8-0 run that expanded its lead from 10 to 18 points at 40-22 with 4:48 left to play. Junior Brooke Stonebraker was the catalyst in that run scoring 6 of the 8 points including two from the free throw line. Hannah Barga also connected on a pair of free throws during that run. “Brooke is doing a good job getting rebounds and playing within herself,” Coach Stonebraker said. “She is putting the ball up and in and hitting some free throws. Arcanum only had four players reach the scoring column in the game, also a likely result of the Tigers’ pressure. Unger led the Lady Trojans with a game-high 15 points. Fellow freshmen Taylor Gray and Madelyn Fearon had 8 and 4 points respectively and junior Kayla O’Daniel accounted for the other 6 points. Ording and Custenborder were the top scorers for Versailles with 10 points apiece. Winner had 9 and Stonebraker contributed 7 from the post. Four other Tigers contributed points in the game with 4 points each from Liz Watren and McEldowney and 2 points apiece from Barga and Savannah Toner. With the regular season nearing the end, both teams get back on the court on Thursday with Arcanum hosting Tri-Village in its final regular season match, and Versailles going on the road to Coldwater. Versailles will close out its regular season at Jackson Center on Saturday. Arcanum – Madelyn Fearon 2 0 4, Hailey Unger 5 3 15, Kayla O’Daniel 3 0 6, Taylor Gray 4 0 8. Totals: 14 3 33. Versailles – Liz Watren 2 0 4, Caitlin McEldowney 2 0 4, Hannah Barga 0 2 2, Savannah Toner 0 2 2, Elizabeth Ording 4 2 10, Lindsey Winner 4 1 9, Kelsey Custenborder 3 3 10, Brooke Stonebraker 2 3 7. Totals: 17 13 48. 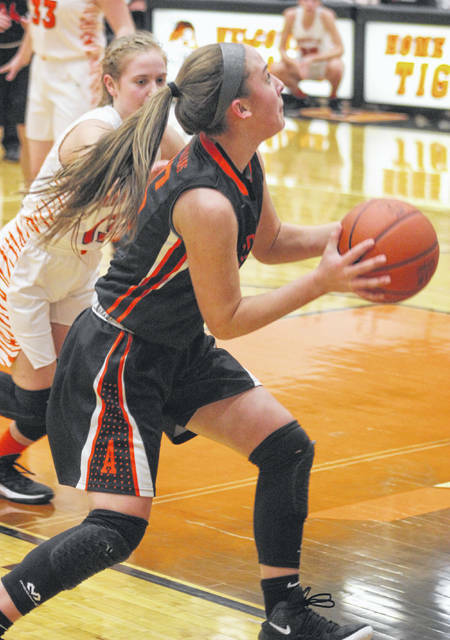 3-pointers – Arcanum 2 (Unger 2), Versailles 1 (Custenborder 1). Records: Arcanum (14-7), Versailles (15-5). JV score: Versailles 54, Arcanum 50. The Daily Advocate sports editor Skip Weaver can be reached at (937) 569-4316 or by email at sweaver@aimmediamidwest.com. You can also follow him on Twitter at @skipweaver65.